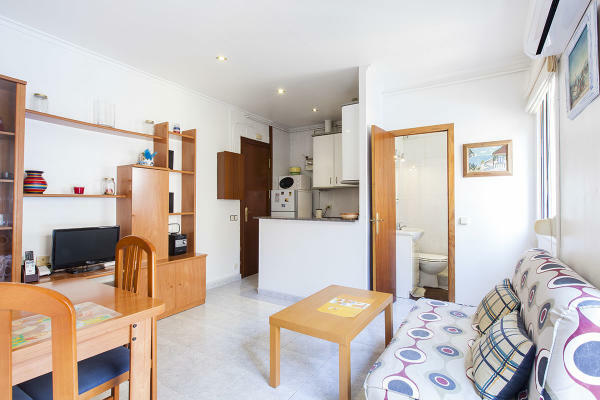 This is a lovely apartment close to the Barceloneta beach. You’ll be just steps from the popular Passeig de Joan de Borbó, as well as the new Port Vell, complete with shopping centre, bars and restaurants. This area is buzzing with life and is really well communicated with the rest of the city either by public transport or on foot. This apartment is ideal for one or two people. It has one bedroom, a bathroom, a kitchen as well as a dining and living area with balcony. Both living and sleeping area have plenty of natural light during the day. WiFi, central heating, air conditioner, hair dryer and a wasing machine are available for your convenience. The kitchen comes fully equipped with toaster, coffee maker, kettle and microwave, as well as an oven, and pots and pans allowing you to prepare your home-cooked meals easily. You could even grab some fresh ingredients from the nearby Mercat de la Barceloneta and try your hand at some Mediterranean dishes. A cosy apartment in a great area – perfect for spending some time in Barcelona.